Summer is a time for change in the classical music landscape. The season came to an end with the last days of June, and before the new season opens with a new repertoire in September, the audience is offered different kinds of experiences. All over the world, summer is the time for music festivals, when classical musicians contribute to events. So it is also the time when musicians have the opportunity to travel and take part in events in many corners of the world. Most Egyptian musicians and conductors usually turn their eyes to Europe, Arab or Middle Eastern countries. Asia is a less common destination, except for China, which numerous Egyptian musicians and troupes visit due to the officially strengthened cultural relations between the two countries in recent years. Japan, however, is almost absent on the Egyptian musician’s tour map. For this reason many eyebrows rose when, last month, the Egyptian conductor Nayer Nagui announced he would be heading to Tokyo. “The invitation initiative came from mezzo soprano Itsuki Mikiko, director of Japan’s Kappabashi Opera Company,” Nagui explains, adding that this contact had been made many years before through tenor Sobhi Bidair, who in the 1990s taught Mikiko in Egypt. With soloists, choir and orchestra all reduced to 10 musicians and a pianist, the whole troupe used minimal tools to deliver highly artistic performances. Nagui adds that when he reached Tokyo, the show had almost been finalised, awaiting the conductor. The conductor underlines the impressive efficiency of the Kappabashi Opera Company and Japanese artists in general. Nagui’s praise of the Kappabashi Opera Company extends to many aspects of the musical life and professionalism he noticed in Tokyo. He explains that while in Japan there are several national opera houses and theatres, there is also a multitude of private opera troupes with soloists. They usually do not have their own stage but rent one for performances, as was the case on both evenings he conducted with the Kappabashi Opera Company. With an incredibly high rent, reducing time was the only option. Impressed by the long hours of work which nevertheless do not diminish the music’s quality, artists linked to several opera companies and juggling several stages and repertoires, Nagui raises his chapeau to such artistic capabilities. 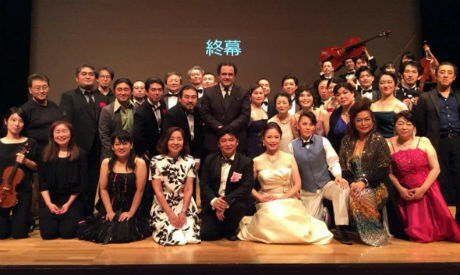 The joyful experience of making music and staging one of Verdi’s most beautiful operas was rewarded with a full house of over 600 in an evening attended by people from all walks of life and from different generations, and honoured by the presence of Hatem Al-Nashaar, deputy to the ambassador of Egypt to Japan. Japan has its own musical traditions yet as we all know, the presence of Western classical music is very strong and scores of Japanese classical music performers are known to international audiences. As Nagui points out, music education and awareness are also very apparent, a fact that he could sense in the audience’s reactions. Creative efficiency and interest in Western classical music is borne out by statistics. According to a study by the Opera Base website, Japan ranks 34th in the number of opera performances for the 2017/18 season, being the first Asian country on the list (China, the 37th, is the second Asian country). Tokyo offered over 70 opera performances in this past season by national companies alone. It is interesting to add that Verdi is the most popular Western opera composer staged in the country and internationally. 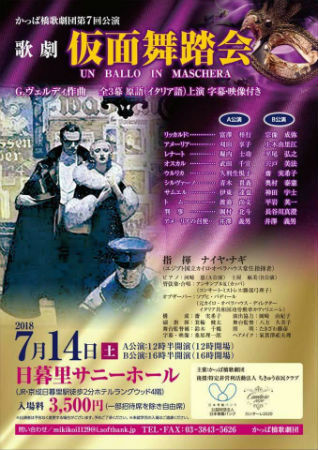 The popularity statistics reveal that Un ballo in maschera is the composer’s seventh most frequently staged opera, with La Traviata being first, followed, in order, by Rigoletto, Aida, Nabucco, Il Trovatore and Otello. On the other hand, the classical events website Bachtrack reveals that Japan is “the most romantic” country, with 67 per cent of its concerts and Western operas coming from Romantic period composers. It is a surprisingly large percentage, once you note that the second place in romantic ranking is taken by Austria with 50 per cent of the repertoire.